Life Is Sweet...: Happy 4th!!! When I saw this on Eileen's blog the other day, I knew I had to make one. These make cute guest towel holders for your bathroom. And because the 4th of July is this weekend, I decided to go with the red, white and blue theme. The cupcake holder is a Sizzix scoreboard die. And speaking of Eileen, I found this picture of the both of us taken this year at CHA winter at the Sizzix booth. She is the designer of all the scoreboard dies. Thanks for stopping by and have a wonderful 4th of July weekend!!! OMG!!! 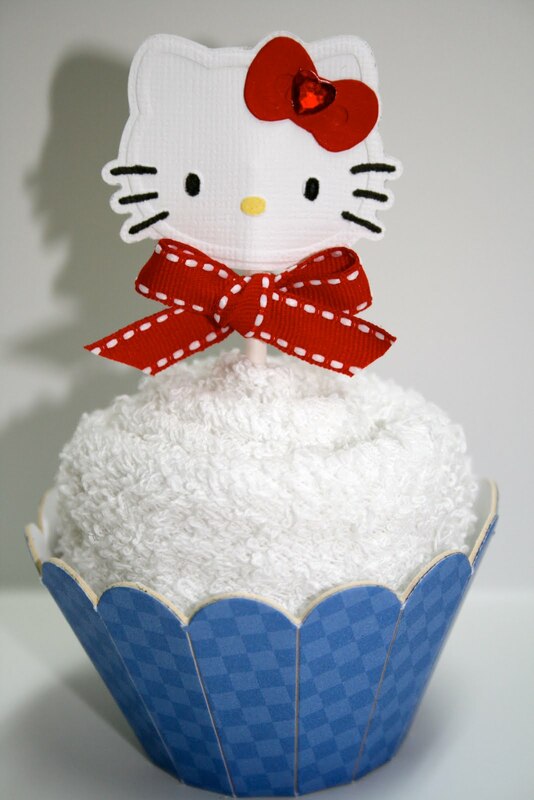 Cheryl, this is the cutest, cutest towel cupcake EVER! Lol, and all this time I was wondering what I'd ever do with a cupcake wrapper die! I wanna make one too! Really cute Cheryl. Who would have ever thought? Thanks for sharing with all of us. That's another super cupcake project! How did you roll up the towel to form the shape? I'm sure that my guests would rather wipe their hands on their clothes than mess up the towel cupcake. LOL! I thought it was a real cupcake at first glance LOL! What a fun creation! This is so cute! When I just looked at the picture, I thought it was a real coconut cupcake at first. Thanks for sharing. Joyce J. So CUTE!! Love the Patriotic theme you have going. What a cute cupcake, great idea Cheryl. I love this cupcake holder and saw the video on Eileen Hulls' site. Then I saw it on your site. Can you tell me where you got the mat board or chipboard from? I ordered the die and it should be here anyday, but need to find out where to get the mat board from. I'm going to make these for my mom's birthday dinner for the family. Thought they were so cute. It is Sizzix chipboard that I use. You can find it on the Sizzix.com site. Cheryl, love your version of the cupcake towel project! Thanks for linking :-) Hope to see you in January!